What is News, Blogs and Forums? And how do I use it? 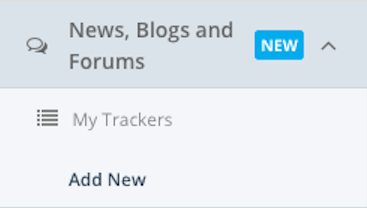 1) Go to your 'My Tracks' page and click 'News, Blogs and Forums' on the left-hand navigation bar. Select "Add New". 2) Type the keyword you'd like to search in the search bar. 4) Save your search! Once saved, this tracker will start collecting all articles that use your keyword moving forward.